Ever wonder what it would be like to be a hazardous materials removal worker? It’s definitely a challenging, demanding job that requires a strong, meticulous work ethic. But it’s also very rewarding—think about it, how many people can say, “I made the world a better place today!” Every worker at H2 Environmental Consulting Services contributes to a healthier Southern California by safely and effectively removing contaminants from homes and commercial properties. By law, hazardous materials workers are required to wear certain gear for varying types of projects. PPE (personal protective equipment) can include gloves, goggles, booties, hoods, and even respirators which become necessary when removing especially toxic waste. 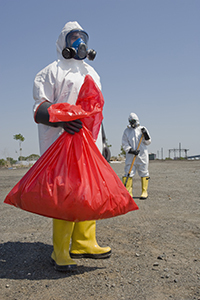 At H2 Environmental Consulting Services, we’ve taken care of so many hazardous materials removal projects, from the most dangerous to the least, and we always make sure our workers have the proper gear to stay safe from contamination. Our workers’ health is extremely important to us! Procedures are extremely important in the hazardous material removal business because they’re how we know that substances are being disposed of properly, efficiently, and lawfully. Everything we do is planned in advance. We document every aspect of every project so we know for sure that everything has been accomplished according to plan and in an effort to minimize any risks. At H2 Environmental Consulting Services, we even teach other companies how to follow the law in terms of environmentally-safe waste disposal, so just about all our employees can recite the proper polices from memory. As the saying goes, those who know, teach! When a project is urgent, our workers are often expected to work non-traditional hours to avoid interrupting normal business activity—in a hospital, school, office building, or office building, for example. If you have an urgent project that needs to be completed right away, we can often have workers on-site within 24 hours. The safely and continued health of all Southern Californians is extremely important to our company’s mission, so we’ll do everything in our power to take care of your hazardous materials emergency as soon as possible. To get started today, just call H2 Environmental Consulting Services at (800) 524-3578 or email CustomerService@H2Env.com.